Restrepo is the outpost the troops out of the bestseller War of Sebastian Junger build up. Restrepo is not just their outpost but also their home. Things you build by yourself are you favourite things because when you use them you could be proud of yourself. It’s like when you build up a tree house in the forest and the same night you sleep in there. You don’t sleep in there because it’s better to sleep than your own house you sleep in there because you’re proud on yourself and you want to feel how proud you can be on yourself. If you’re trying hard for something it needs to pay back and that’s why all the soldiers love the place of Restrepo. In the end it also got liked because after a time they started to like fights and Restrepo got more fire fights a day than the base. Restrepo isn’t the most beautiful place on earth but it’s what people live in. It’s their home and because they built it up it’s one of the most beautiful places on earth for them. The book “Killing” was for me more interesting than the first book, “Fear,” basically because I feel that the act of killing has also the factor of fear in it. As I was listening to the podcast I thought of many points, but sadly every time I thought about them both of you started bringing them up and left me with only very few but interesting points to talk about. First I would like to respond to the points I thought were really interesting you brought up, such as our security, the feeling of killing, its consequences, and its reasoning. During the first minutes of the podcast Mr. Brightman asks a question that says something like “do you feel safer if there are people fighting on these hostile areas in the world?” Mick´s response was exactly the same thing I´d answer, “Yes, of course.” I think that these brave people have chosen to risk their lives in order to secure international safety in such a complicated thing as terrorism, and therefore they deserve recognition as international heroes. I also think this because I could not see myself in such a situation because I think I wouldn´t control myself thinking of the fact that on me depends a good part of international security. This theme also has to do with killing, and how a human being feels about killing. I think the art of killing has to do with the act of recognizing the so-called “good” and “bad” guys. For Battle Company the “bad” guys are clearly the Taliban insurgents as well as Al Qaeda. On the other part, for some Afghanis and other extremists, the U.S. military are the “bad” guys. I think this factor, mixed up with revenge, is the reason why people in general, such as, but not limited to the Taliban and the U.S. military kill each other. For example, the American troops attacked the Taliban fighters that planned the ambush in which two Americans died, basically because they felt they deserved revenge. They also mention that they did it so that there is less possibility of one member of the platoon to get killed, which also makes sense. 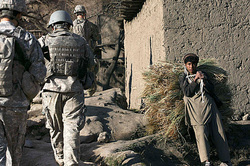 “One Platoon; One Valley; One Year” is the motto of the documentary “Restrepo,” directed by Tim Hetherington and Sebastian Junger. Probably one of the best documentaries ever made about American troops fighting against Taliban insurgents in remote Afghanistan. “Restrepo” is a chronological report of one year about Battle Company, which fights in Afghanistan´s most dangerous region, the Korengal Valley. Although it has a lot of things in common with Junger´s New York Times-Bestseller War, this documentary shows in a 93 minutes the courage, fear, and struggle of American soldiers in the Afghanistan war, as no other documentary has ever before. During the film, the 2nd Platoon is ordered to defend an Observation Post (OP) named OP Restrepo, for Juan Sebastian Restrepo, a Colombian-born naturalized U.S. citizen platoon medic who was killed earlier during a fire fight. The film portrays the construction of the OP Restrepo advanced outpost, as well as the challenges and relentless firefights they faced while they managed to build the outpost from nothing in only one night. It also shows the challenges and decisions they have to face in order to target Taliban insurgents and not Afghan civilians, which often becomes a major problem. The film is a must-see because it also makes you think about the Afghan people and the consequences it has to their daily lives. But one question remains: would you have the courage to fight in a place where one false step can become a catastrophe? Wake up early in the morning, not relaxed but full of fear. Continue with the first fire fight. Having breakfast and instead of a relaxing after it the second fire fight is on. A short lunch and then the next fire fight. 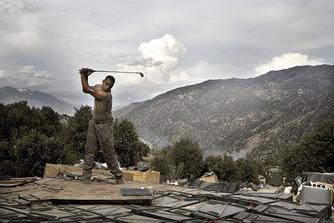 Up to seven fire fights a day is the usual day routine of a soldier based at a remote Afghan outpost. Those guys don’t have an easy live. But the war doesn’t really hurt the soldiers. The person that got hit by such a war are the civilians that live under the conditions of friends and family dying, soldiers controlling them every day. The sound of guns and war heard mainly all of the time. If you still think a soldiers life is harder, than think about that point. The soldiers chose to go into war and those civilians didn’t all they ever wanted is peace and wealth. They want their country like how it has used to be. Mothers and child are addicted of a drug called Opium, because they have no money and need to be stilled anyhow. They have a hard life and that’s just because they love their country. Why could that be like this and what’s the only solution to that? Sebastian Junger’s bestseller book War is one of the most popular and insightful books about the war fought by U.S. troops in remote Afghanistan. This book is trying to show the readers what war actually feels like, and tries to analyze every aspect of war. Junger’s story is a journey from the mental to the physical state of a soldier during open combat. It is a book that makes your heart beat as if you were on the middle of the fight, as well as it makes you reflect on the causes and damages of war on individuals. For example, on the first chapters, Junger tries to explain and analyze the sense of fear. The fear that a soldier feels when they are in the middle of an ambush and adrenaline goes up so fast that their brain can almost operate, and your heart beats so fast you can’t even aim your rifle. The author also insists that being a soldier remains the ultimate challenge of character because it does not only need experience and strength, but also a strong personality and to stay focused. Another example of strong personality and how a soldier gets so much into war that forgets his principles, is how a couple of soldiers start smoking due to stress. They say that even though they hate how cigarettes taste, they think it’s relaxing and drives the tension away for a while. This clearly shows how war can consume individuals up to the point where they have to break their own principles in order to survive. Aziza “unwraps [opium], breaking off a small chunk as if it were chocolate, and feeds it to four-year-old son, Omaidullah. It's his breakfast -- a lump of pure opium” (Damon). The quote from the article we read about the civilian environment still gives me the chills. Whole communities of people in Afghanistan have developed a culture that has led to generations of drug addiction. Addicted mothers addict their children who start an already challenging life under the influence of drugs. According to the article, this problem affects over one million Afghani’s. When I read this article and discussed it with students, what struck me the most was the inability to foresee all consequences when planning a war. No matter how well-trained or experienced war planners are, it’s impossible to think of everything. Military resources and strategy often blind military planners to the social consequences of war. This is understandable because one must win the war militarily before winning the peace. When the U.S. and NATO committed to eliminating Al Qaeda and removing the Taliban from power, I wonder how much they considered issues they would have to address after accomplishing their military objectives like rampant drug abuse, addiction and trafficking. Tackling this problem will be crucial to establish security and stability in Afghanistan’s future. The U.S. and many NATO countries have drug problems of their own at home that they have struggled to confront. How do you solve a terribly complex problem like this in someone else’s country? When more than one million people are addicted to drugs and thousands more profit and gain power from the drug trade, it will take a generation to see significant progress in this area. Will the international community endure a generation-long commitment to Afghanistan? Damon, Arwa. "Afghan infants fed pure opium ." CNN.com . N.p., 24 Jan. 2011. Web. 16 May 2011. 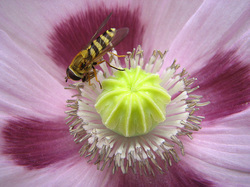 <http://edition.cnn.com/2011/WORLD/asiapcf/01/20/afghan.opium.kids/index.html>. Welcome to the SIS War Blog! Unit Question: How do we justify war? Significant Concept: What are the consequences of war? Area of Interaction: (Environments) How do our Language A skills enable us to understand different environments? During our unit, we will be reading War by Sebastian Junger, watching the award-winning documentary Restrepo and examining current events media about the war in Afghanistan. We welcome you to make comments, respond to our posts and suggest resources for us to consider.